If your love for snapping blossoms grows each time you pick up your camera, it might be time to research flower photography markets. Floral imagery is a hot commodity right now. However, the key to making a profit from flower pictures is rooted in superior technique. Flowers are one of the more popular photo subjects, which means you need to capture amazing images to really stand out in the crowd. To accomplish this, it's important to cultivate a photographic eye. Noon is the worst time to take pictures of flowers. The sun is at its peak, which means you will not be able to capture shadows to emphasize your subject. What's more, you should never take pictures in direct sunlight. While plants may appear to be at their prettiest in the sun when looking at them when the naked eye, neither film nor digital cameras can cope with the stark contrast in colors. You'll get better results if you shoot in overcast conditions. Otherwise, try using a polarizing filter to reduce glare and enhance colors when shooting in direct sunlight. Another option is to shoot at sunrise or sunset when you are offered light that yields more pastel tones. Take advantage of all nature has to offer. For example, if you want to capture a shot of daffodils dancing in the breeze, then wait for a slightly windy day to take your photo. Don't let inclement weather conditions stop you from photographing flowers. Raindrops, dew, or frost on plants and flowers can add a new dimension to your pictures. Likewise, including a few clouds in your shot can provide a sense of scale to your images. Professional floral photographers also look for patterns in nature and emphasize them. For example, a shot of a single flower can be enhanced by including the edge of a mountain, part of a sand dune, or a twisted branch. If you are shooting with a digital camera, it's best to use lower ISO settings. Ideally, you want to eliminate as much grain as possible. To do this, set your camera at ISO 100. If you are shooting with a traditional film camera, then focus on using the slowest possible film. Slow films have very little grain and enlarge well. In addition, they also allow for enhanced saturated color reproduction. Most professionals use Fuji Velvia slide film (ISO 50), though any brand of ISO 100 film is acceptable. 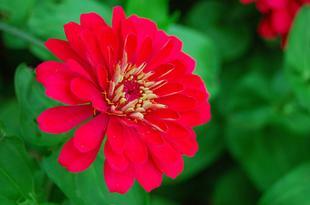 Potential clients want to see the flower as the subject, not a bunch of extraneous "noise." To avoid distracting backgrounds, use a large aperture to blur the background and keep the focus on the main floral subject. If your goal is to sell stunning floral shots, never let unrelated elements distract the viewer from what you want to portray. Once you have determined who might be interested in the kinds of images you are capturing, then outline a direct marketing plan. Targeting specific customers will allow you to generate a larger paycheck than simply placing your flower photographs on stock websites and waiting for paltry checks to roll in. If you are trying to break into flower photography markets the best advice is to take a lot of pictures. Practice and patience are the keys to profitable pictures. It's also vital to learn from your mistakes, technically and compositionally. Finally, study the work of accomplished floral photographers, so you too can allow your passion to blossom into a profession.